Yeah, that. The dock reverts to the default Apple dock. 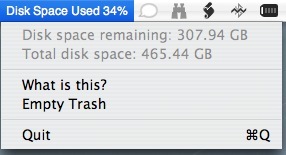 iMovie keeps telling you there’s not enough space to save anything (even to an empty partition). InDesign spits out all sorts of weird error messages when you open it. And oh yeah, because of a certain login hook we run, FontExplorer X loses our entire Font Folio type library (not FontExplorer’s fault). Meanwhile, our poor data heavy students have no idea what’s going on. The Solution: QuotaMonitorMenu places the userâ€™s home folder quota status right in the menu bar. It will also pop up warnings at regular intervals. All warnings and text are customizable. Yes, a very handy little utility indeed.